Passengers could be catching direct trains between Wrexham and Marylebone station in London if plans announced by a new rail company go ahead. The newly formed Wrexham, Shropshire and Marylebone Railway Company (WSMR) plans to run five trains a day between north-east Wales and London from 2007. The company said the journey time would be cut to three hours 15 minutes. 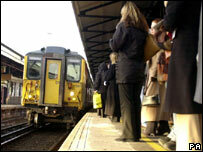 Travellers currently have to change trains in Chester, Crewe or Birmingham for a train into London Euston. The planned service would stop in Ruabon, Chirk and Gobowen as well as Shrewsbury, Telford, Cosford and Wolverhampton. A spokesperson for WSMR said the company - a joint venture formed by Renaissance Trains Ltd and Laing Rail - had been negotiating with Network Rail for some time. Renaissance currently operates Hull Trains and Laing has the Chiltern Railways franchise. Director of Renaissance Mike Jones said plans for the service were "well underway". "We have an agreed timetable - not yet with Network Rail - but with train planners at Laing rail who own Chiltern Railways. "They have identified five paths to run services from Shrewsbury and we believe it will be possible to extend those to Wrexham," he said. He added that the fares being offered to passengers travelling on the route would be competitive. "On the basis of our business plan, we would expect the average fare to be £25 return - that would be the average fare we would expect people to pay to make the service viable," he said. Transport experts have welcomed the proposals saying that the new service could compete with the bigger rail companies including Virgin Rail. Professor Stuart Cole, director of Wales Transport Research Centre at the University of Glamorgan said: "Anything that adds to the number of trains going from north Wales into the Midlands of England and into London is to be welcomed. "Hull Trains is an independent company that's been successful and is still running its services - it's found a niche and hopefully this is a niche that will be successful. "There is a good chance they can pull a number of passengers away from that (Virgin Rail) service." Wrexham MP Ian Lucas said that the service was long overdue for the area. "I hope this will be a success, and it could take some of the pressure off the West Coast main line," he said.